My article ‘Healing, Belonging, Resistance, and Mutual Care’: Reading Indigenous Ecopoetics and Climate Narratives has been published in the new issue of the online open-access journal Literary Geographies. View the pdf here. Narratives of climate change place it alternately as an environmental justice issue, a national and global security issue, an apocalyptic threat to life on earth, an opportunity for social change, and more. 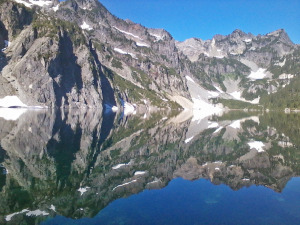 In this article, I aim to bring critical geographic work on climate narratives into conversation with contemporary poetry, through close readings of specific poems. 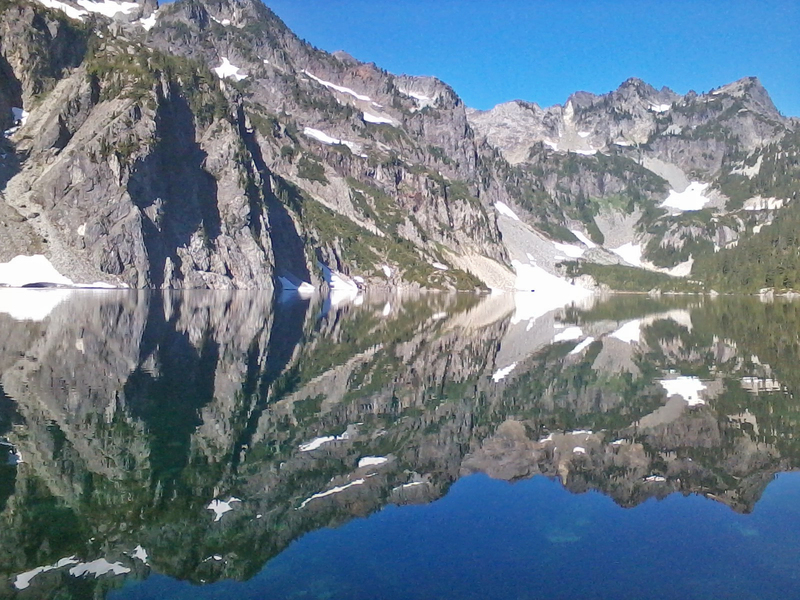 I argue that the work of contemporary poets, and in particular the work of Indigenous ecopoetics, is rich in poetic texts that offer imaginative practices for recalibrating climate change narratives. I look particularly to works by Craig Santos Perez, Kathy Jetn̄il-Kijiner, Allison Adelle Hedge Coke, Joy Harjo, and Linda Hogan. I approach the poems as both a critical geographer and as a poet, thinking through and with their form and content in relation to climate narratives, and in relation to a description of Indigenous ecopoetics by Perez. I meet these poems as stored energy, as actors themselves in a human and more-than-human collective. A close reading of the craft of creative texts—particularly to the level of the line in poetry—highlights the inextricable connection between form and content in how a poem acts and means in the world. As a non-Indigenous reader of texts by Indigenous poets, my goal is not to perform a ‘master’ reading or analysis of these texts, but rather to learn from the poems and in doing so attempt to decolonize my own thought, a process that is a constant practice. With work by Daniel Biegelson, Rosemarie Dombrowski, Gabrielle Grace Hogan, Rose Knapp, W.J. 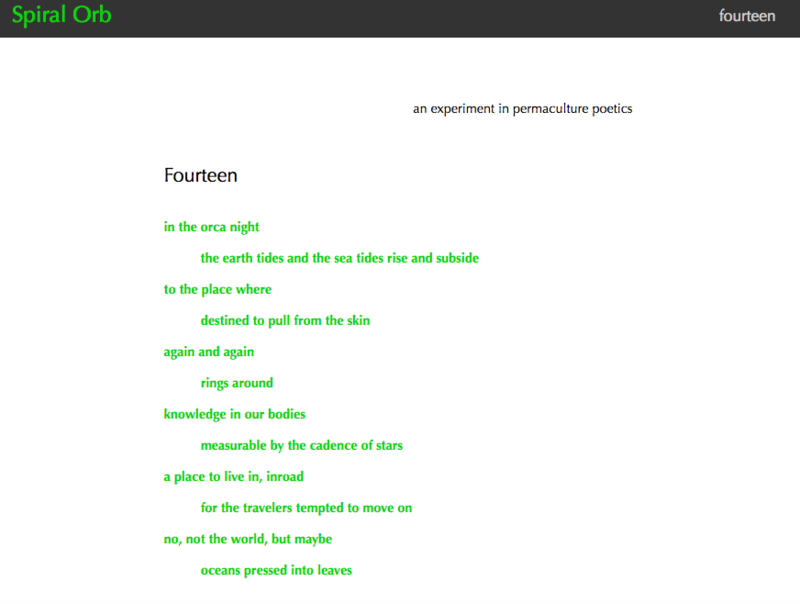 Lofton, John Martin, Michael J. Pagán, Stephen Siperstein, Jonathan Skinner, Julia Wieting, Tyrone Williams, Gavin Yates + an entry poem composted from fragments of each of the pieces in the issue, Spiral Orb Fourteen is here. 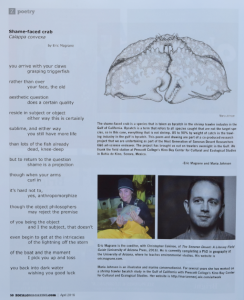 Early poems and drawings from Bycatch appear in April’s Zócalo and at the new online Coordinates Society Magazine. Bycatch is a co-produced art-science project that combines geohumanities, political ecology, poetics, art, and marine ecology to creatively respond to the shrimp trawling industry in the Gulf of California. “Bycatch” refers to everything captured that is not the target species, so in this case, everything that is not shrimp. Approximately 87% of the weight of catch by shrimp trawlers is made up of 225+ species of bycatch fish, invertebrates, and turtles. The majority of shrimp caught in the industry is sold in the U.S. I am collaborating with marine biologist and illustrator Maria Johnson on this project as part of the Next-Gen 6&6 Art + Science initiative. The field work for this collaboration has included overnight trips aboard shrimp trawlers off of Bahía de Kino, Sonora. See more on Bycatch on the project website. 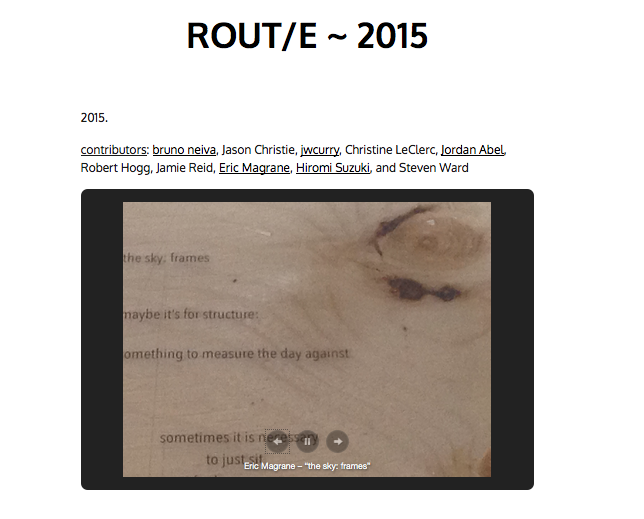 A few of my poems (“the sky: to a bird” and “the sky: frames”) are published along a trail at Baxter Conservation Area in Ontario, Canada, thanks to Chris Turnbull and her footpress. Thrilled to be included in this cool project. It looks like one of them is inside a tree. June 2016 update on how the poems are weathering Baxter. 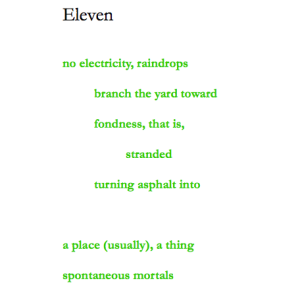 With work by Anna Lena Phillips Bell, Alyse Bensel, Melissa Buckheit, Jefferson Carter, Matthew Cooperman, Patrick Jones, Jeffrey Jullich, Stacy Kidd, Rico Moore, Ellen Noonan, Dan Raphael, Jessica Reed, Chris Turnbull, and an entry poem composted from fragments of each of the pieces in the issue, Spiral Orb Eleven is here. 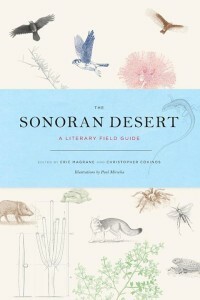 The Sonoran Desert: A Literary Field Guide is now available for pre-order here. My article “Situating Geopoetics” is in the Association of American Geographers’ new journal GeoHumanities. Download the pdf here. The form of the ars poetica is one in which the poet makes a statement on the art of poetry. Consider this a kind of ars-geo-poetica, a groundsetting for and statement on geopoetics that intends to both situate and to break open the field. This is an invitation for geopoetic texts and practices that draw on the work of poets as well as geographers, for an enchanted, earthy, and transaesthetic approach that moves to juxtapose contemporary poetics, particularly in the realm of ecopoetics, with critical human geography. Looking to geographers, poets, literary scholars, and poems themselves, this article aims to help situate and historicize geopoetics, provide a brief inventory of the current field, and carve out sites for future work. Key Words: creative geographies, ecopoetics, geohumanities, geopoetics, site-based poetics. The collective glossary includes terms like Biotariat, B-RAD: Bio-Regional Attachment Disorder, Indigenous ecopoetics, Phylogeny, Relaxation time, and Walking. My contribution to the glossary is geopoetics.